Eyeing one of them newly announced Sony Xperia Z5 Compact phones? Truth is, not that many people outside of Japan are interested in sub 5-inch display smartphones, so we understand if your sights are set elsewhere. 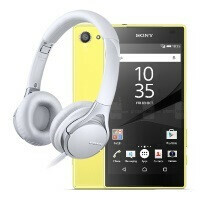 This may also be part of the reason why Sony is generously throwing in a pair of MDR-10RC headphones with Xperia Z5 Compact pre-orders in Denmark, Norway, Finland, and Sweden. Mind you, this is a pair of $120 earphones we're talking about, not a complimentary pair of buds. The foldable earphones boast cushions, 40mm neodymium drivers, sculpted air vents, an inline remote and mic, and their own travel pouch. All in all, the MDR-10RC looks like a pretty decent piece of kit, although their evened-out frequency response probably won't jibe with fans of phat hip hop and techno beats. But hey, you can't beat free, and these cushions should help keep your ears warm in the cold Nordic weather! As for the Sony Xperia Z5 Compact, this is indeed a compact, but thick 8.9mm handset with a 4.6-inch 720x1280 resolution screen and IP68-certified water and dust-resistance. It is powered by an ubiquitous Snapdragon 810 SoC/2GB RAM configuration, offers a fearsome 23MP rear camera and a 5MP snapper, along with a 2,700mAh battery and Android 5.1.1 Lollipop. An impressive little smartphone it is! I still wouldn't get this phone. I own an Xperia Z1C and all I have had are bad experiences. Twice I had to send the phone off to be repaired under warranty. First time was the screen was faulty, second time water got into the phone along with a hit and miss camera and inaccurate screen. I can show you the same story & proof about another phones from other major brands. Very old news, this was already known on day 1. 8.9mm is not thick. People just got used to 7mm phones but 8.9 is just alright for better grip. I'll complain to my local retailer if I don't get the same deal as in Netherlands. Sony should better give me a good freebie just like what lg g4 did during their launch. Still need some clarification on the 810, has anybody reviewed them and mentioned anything about over heating? The Z compact series is such a work of art but the 810 just breaks the deal if it still possesses the same issues as version 1. I have the headphones, and they are a great pair. Highly recommend them, the sound quality is superb. It's a shame they not giving anything away in the UK. I'm debating if I should try my first iPhone with a 6S or if I should get the Z5 Compact, the free headphones could have sealed the deal for the Z5C. I probably won't pre order if I decide to go with the Z5 due to there being a chance they might do a giveaway afterwards or if preorders are poor. I agree. I'll just buy iPhone 6S if they don't do the same/similar giveaway in Turkey... Knowing Sony Turkey, I really doubt they'll do such giveaway though. The same offer here in East Malaysia. This is what failing companies should do...heck even the best should do this.